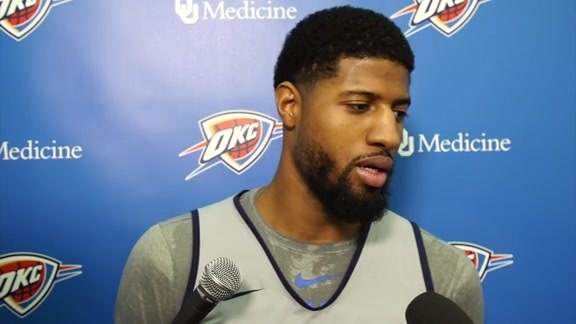 CASTAIC, Calif. – Paul George had no idea how perfectly his plan was going to turn out. It may have even turned out a little too well. The goal of the 5-time NBA All-Star’s 2nd Annual Fishing Tournament was to turn first-timers into aspiring anglers. Turns out, one of the newbies stole the show, but that surprise was only revealed at the end of the day. 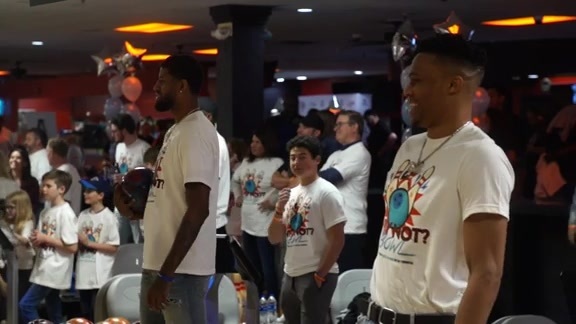 With professional anglers, celebrities and a trio of his Thunder teammates – Russell Westbrook, Andre Roberson and Abdel Nader – George hosted his tournament on Saturday to raise money for his charity foundation. off the court → on the lake The crew joins @ygtrece at the 2nd Annual Paul George Fishing Tournament. George himself is an avid fisherman, and is always thrilled to share the hobby he became passionate about long ago with new friends and teammates. This year, he had three Thunder players to introduce to real, serious bass fishing. His fellow All-Star, Westbrook, hit the water on Lake Castaic at 8 a.m., donning a black bucket hat with white Why Not? logos printed across it and preparing for his first time to hold a fishing rod and reel. By the end of the day, Westbrook was casting a perfect line, and learning the tricks to get the fish to bite. Roberson was new to the sport as well, and despite it being a tough day for everyone on the lake to catch anything due to a sweltering 100-degree heat, the Thunder's defensive stopper nearly stole away a 4-pound fish. Just a foot or two before Roberson was able to reel his bass into the boat, the Thunder guard saw the fish’s mouth open before it took one last dive to squirm away. In professional fishing tournaments like this one, only fish of a certain weight can be brought back to shore, and at the final weigh in George and Westbrook each had only one fish to bring to the podium, despite catching a dozen or more little ones throughout the day. Roberson’s crew came up completely empty. But then came one of the final boats, which included Nader, the newcomer to the Thunder roster who hadn’t fished before despite always enjoying the outdoors. Throughout the 6 hours on the lake, George, Westbrook and Roberson had been visible and camped out along the shore line. Nader was nowhere to be found. Turns out he and his professional partner knew Castaic’s secrets, because they brought back the limit – five bass fish – including the biggest fish of the day at 4 pounds, 12 ounces. When the surprise winner was revealed, fits of laughter and some trash talk ensued. The playful ribbing between teammates all day long gave the whole event an extra layer of fun. After all, these guys are professional athletes and will use any excuse to compete with one another. As Nader accepted the trophy for the biggest fish, his teammates, General Manager and Executive Vice President Sam Presti, Head Coach Billy Donovan and other Thunder staffers all joined in on the celebration. George was eager for a rematch on the spot, but he couldn’t help but stand back from the crowd and take it all in. It’s still hard to believe for him, that a kid from Palmdale could make it to the NBA and create a platform big enough to draw professional fishermen from around the country, his teammates and other celebrities out to the lake he grew up going to with his dad. “It makes me feel good. It makes me feel we’re doing things the right way. It makes me feel like we’re on to something,” George said. George’s humility shines through his every conversation, but also shows in his actions. In addition to the $25,000 check that the Thunder forward handed out on Saturday to the mayor of his hometown of Palmdale, California to support the Department of Recreation, George also funds and supports initiatives in Oklahoma City and the Los Angeles area to promote active lifestyles in kids. For example, George gave a huge boost this past season to the Fish in Schools program in Oklahoma City, which encouraged metro kids to get out on the water. He did the same for his teammates and other first-timers on Lake Castaic, but now the initiation is over. George is turning his attention to beating them all in the competition next summer.